There’s a lot of time and energy spent on market conditions when things are ominous and uncertain (Brexit), but what about when markets are…. stuck? 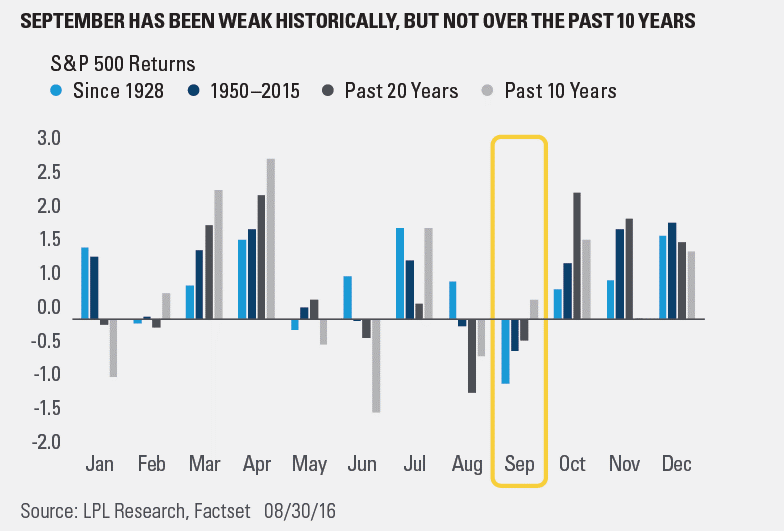 Some might remember this summer as the worst market condition in the last 10 years. Let’s start with stocks. 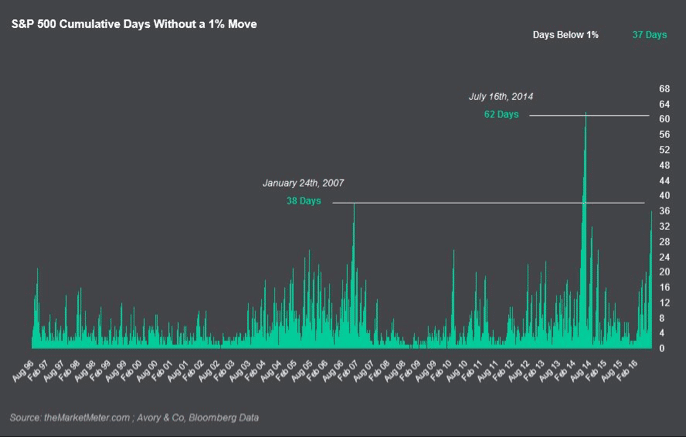 Officially been 38 days without a 1% move, tying the record back in 2007, via Sean David. 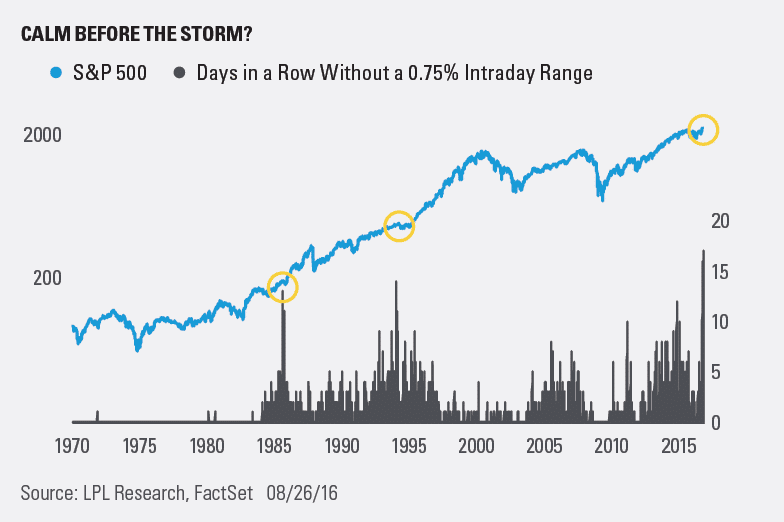 Show another way, past couple of weeks have been one of three times in the past 45 years the intra-day range was less than 0.75%. Lack of movement in any market is typically a bad environment for Managed Futures. When all the markets seem stuck within a very thin trading range, there’s not much opportunity to be had to capture returns. We’re not talking about the stock market. This month was particularly bad managed futures with fixed income, currencies, and softs futures all whipping around. Energies went through two v-shaped reversals. These reversals are bad market environments for Managed Futures. Managed futures as measured by the Soc Gen CTA ended the month down -3.07%, and with a lot of managers cutting their teeth the last week of August. 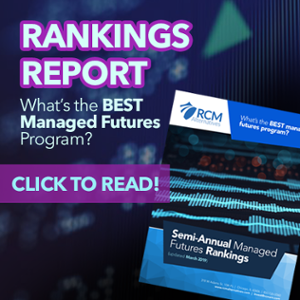 While Managed Futures is still up 2.48% on the Year, Managed Futures is currently 6.01% from its all-time highs back in February. For more perspective, here’s a look at Managed Futures drawdown compared to its previous drawdowns (the current one is in green). The question that everyone is struggling with is now a good time to buy it? By the numbers, this drawdown has the potential to be a great “buy” opportunity. Referencing the first chart in the post, the last time two times there was no volatility to be seen resulted with either big down moves (see 2007-2008) or big up moves seen in 2014. We’ll be the first to say past performance is not necessarily indicative of future results, but it’s worth mentioning that whenever there’s a coiling of volatility, eventually, it has to be unwound. See Crude oil pre 60% drop in price. When it comes to fundamental factors that produce returns over time – whether any of the traditional Fama French factors in equities, or factors such as value, yield, or momentum in commodity and financial futures – the key to success is sticking with the factors and buying the dips; this is conceptually no different than buying equity indices after meaningful sell-offs that bring valuations to cheap levels …. One difference, systematic diversified and risk-managed trend following doesn’t produce crashes, just drawdowns that grind. Our strategy has a positive expectancy considerably higher than our benchmark, but it does have corrections and droughts along the way. The key to success is recognizing this, taking the long view, and taking advantage of these opportunities. I thought it was a good time to add near the beginning of the year as well, as Managed futures really peaked in Aug 2015 and essentially went sideways to the end of the year and to start 2016, and we had exited most of our old positions. Unfortunately, the drawdown has extended as few new trends have yet to really set in. Forecasting the terminus or trough of a drawdown is difficult, but taking advantage of the adage “buy the dip” is pretty straightforward over time… you just need time to validate that it was the right thing to do. This applies not only to systematic factor-based strategies, but also to managers; good managers don’t become bad managers overnight, and vive-versa. But good managers will underperform from time-to-time, while out-performing over the long haul. Like we’ve said before, investing in an alternative strategy after volatile markets fly doesn’t do you or your portfolio much good. Then again, if you’re sitting on your hands with a bunch of cash sitting on the sideline, there is a good argument for keeping powder dry until we get through the election cycle. 09/02/16 – Friday’s Interest-ing Reads | Compound Interest-ing!